Blues Pills, at last, have finally released a DVD worthy of their legendary live performances. 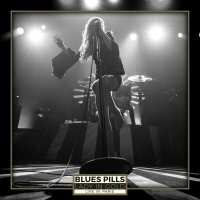 Recorded in Paris at La Trianon in front of 1200 fans, this captures the true essence of the band's amazing live shows and their connection with the audience. The DVD begins as the band leaves their hotel, arrives at the venue and comes alive on the stage. Elin Larsson will always be the focal point of the band; barefoot, twisting and turning around the stage. It's surprising she has any breath to sing. Her voice one moment a whisper, the next a banshee scream as she jolts back and forth towards the audience. Guitarist Dorian Sorriaux still emits an image of tranquillity as he plays his furious Blues-based licks on songs such as 'Little Sun' and 'Little Boy Preacher', and in my opinion, it truly makes him one of the most accomplished up and coming guitar players around. Maybe the band have yet to find their signature song, though there are plenty of contenders; 'High Class Women' and 'Devil Man' have become two songs that have blossomed into live classics over the time. The rhythm section of Zack Anderson on bass guitar and Andre Kvarnstrom on drums play up a storm throughout the show, especially during 'Black Smoke', with head-down concentration, driving the band along like a juggernaut. Alone at the piano for 'I Felt A Change', Larsson puts her personal soulfulness into the song, part Carole King, part Stevie Nicks, and it is one of their more ambitious tracks to date. Having Rickard Nygren added to the touring line-up on keyboards and second guitar has given the band a live sound with a whole new dimension. Special mention should go to Julie Rohart, whose use of camera angles lends a lot to the wonderful raw image of the band in the live arena. Maybe some in-depth interviews or rehearsal footage would have made this release a little more exciting, though the strength of the show itself is enough to recommend.